"The absurd is the essential concept and the first truth"
Albert Camus (November 7, 1913 – January 4, 1960) was an Algerian-French writer and philosopher. He is best known for the existential themes in his writings, particularly the absurdity of existence in a brutal and apparently meaningless world. In novels and plays as well as philosophical works, he portrayed the struggle to find meaning in human life despite circumstances of despair and meaninglessness that defeated all rational systems of meaning. He was particularly skeptical of social and political ideologies. Though Camus’ work is often associated with that of another important French philosopher, Jean-Paul Sartre, there are important differences between these two thinkers. In fact, Camus, like many other existential writers, eschewed the label “existentialist,” preferring to be known as a man and a thinker, rather than a member of a school or ideology. Camus struggled to find a basis for human meaning and solidarity within an essentially meaningless universe. He described this struggle both in philosophical essays (such as The Myth of Sisyphus and The Rebel) and in creative works, including both fiction (The Stranger, The Plague, The Fall) and plays (Caligula, The Misunderstanding, The Possessed). Camus was also very involved in the political turmoil of his day, writing as a journalist for the Resistance movement in France during World War II and speaking out for human rights during the reign of Josef Stalin throughout the 1950s. In 1957 Camus was awarded the Nobel Prize in Literature, but only three years later, at the age of 46, he died in an automobile accident. Camus was born in Mondovi, Algeria, to a French-Algerian settler family. His mother, who was uneducated and later became deaf, was of Spanish heritage. His father, Lucien, died in the Battle of the Marne in 1914 during the First World War while serving as a member of the Zouave infantry regiment. Throughout his childhood Camus lived in the impoverished Belcourt section of Algiers. Despite his poor living conditions, Camus’ unusual intellectual abilities, along with the tutelage of a grade-school teacher, earned him acceptance into the lycée in 1923 and eventually to the University of Algiers. During his school years he pursued both physical and intellectual interests. He excelled not only in academics but also in soccer as well as boxing. In 1930, at the age of 17, however, Camus contracted tuberculosis. This put a halt to his athletic activities (he had been a goalkeeper for the university soccer team) and forced him to restrict his studies to a part-time basis. To support himself, he took odd jobs including private tutor, car parts clerk, and work for the Meteorological Institute. In 1934 Camus married Simone Hie, a morphine addict. The marriage, however, soon ended due to infidelity on both their parts. Throughout his life Camus was passionate about the theater and in 1935, he founded Théâtre du Travail—"Worker's Theatre" (renamed Théâtre de l'Equipe ("Team's Theatre") in 1937)—which survived until 1939. Also in 1935 he completed his licence de philosophie and in May of 1936, he successfully presented his thesis on Plotinus, Néo-Platonisme et Pensée Chrétienne for his diplôme d'études supérieures (roughly equivalent to an M.A. by thesis). In 1940, Camus married Francine Faure, a pianist and mathematician. Although he loved Francine, he argued passionately against the institution of marriage, dismissing it as unnatural. Years later, even after Francine gave birth to twins, Catherine and Jean, Camus continued to insist to friends that he was not suited for marriage. Francine suffered numerous infidelities, particularly a public affair involving the Spanish actress Maria Casares. In 1942 Camus published perhaps his two most famous works. One was the novel The Stranger and the second was the essay The Myth of Sisyphus. During the war, Camus met the famous philosopher and writer Jean-Paul Sartre. Camus often gathered with Sartre's entourage at the Café de Flore on the Boulevard Saint-Germain in Paris. For a short period Camus and Sartre co-edited a Parisian journal which expressed their common literary, political, and existential ideas. Although Camus leaned left politically, his strong criticisms of communist doctrine alienated him from the Communist Party and caused a rift between Sartre and himself. In 1949 Camus’ tuberculosis returned and he lived in seclusion for two years. In 1951 he published The Rebel, a philosophical analysis of rebellion and revolution which made clear his rejection of communism. The book upset many of his colleagues and contemporaries in France and led to the final split between Sartre and himself. In 1957 Camus was awarded the Nobel Prize for Literature for “his important literary production, which with clearsighted earnestness illuminates the problem of the human conscience of our time.” He was the second-youngest recipient of the award (after Rudyard Kipling). Unfortunately, he was not to enjoy this honor for long. Camus died on January 4, 1960, in an automobile accident near Sens, in a place named "Le Grand Fossard" in the small town of Villeblevin. The driver of the car, Michel Gallimard, Camus’ publisher and close friend, also perished in the accident. In Camus’ coat pocket was found an unused train ticket. It is possible that Camus had planned to travel by train, but decided at the last moment to go by car. It is said that earlier in his life Camus had made the remark that the most absurd way to die would be in a car accident. After his death Camus was interred in the Lourmarin Cemetery in France. He was survived by his twin children, Catherine and Jean, who hold the copyrights to his work. The bronze plaque on the monument to Camus, in Villeblevin, France. The plaque reads: "From the Yonne area's local council, in tribute to the writer Albert Camus who was watched over in the Villeblevin town hall in the night of the 4th to the 5th of January 1960." Camus takes his philosophical point of departure from two main ideas that he inherited from nineteenth-century existential thought. The first is Friedrich Nietzsche’s proclamation that “God is dead”; the second is the pronouncement made by one of Fyodor Dostoevsky’s characters in The Possessed: “if God is dead, everything is permissible.” With an intellectual and moral integrity not often found among thinkers, Camus wrestled profoundly with the problem of how to find meaning and value in a godless universe. Working against the two poles of institutional religion on the one hand and secular nihilism on the other, Camus sought to steer a philosophical course which emphasized intellectual honesty, individual freedom, and ethical commitment. In doing so, he insisted on a kind of “lucidity,” which meant recognizing and accepting the realities of human existence without turning a blind eye to its burdens or finding security in false sentiment. Given this problematic one of the main themes in Camus’ work is his notion of the “absurd.” As with the term “existential,” the notion of the absurd can be misleading, particularly when one moves within different existential philosophies where the term is used quite frequently. In general, it can be said that among existential philosophers (or ‘philosophers of existence’) the notion of the absurd is derived from the conviction that all of reality or existence cannot be reduced to human reason. Or, to put it another way, our rational ideas or conceptions of life always fall short of the ambiguities, complexities, and perhaps even contradictions embedded in life itself. But although many existential writers refer to existence as absurd, they often have different ideas regarding the term’s specific significance within their particular philosophies. For example, Sartre considers individual experience to be absurd so that ‘reality’ is kind of “nothingness” out of which we create our own subjective meanings. Søren Kierkegaard, on the other hand, believes that because certain religious truths appear to us as absurd or paradoxical (for example, that Jesus is both man and God) means we cannot reach the Absolute through a merely rational process. For Kierkegaard, then, ultimate reality is more of a divine and paradoxical mystery which one can only grasp through the absurdity or paradox of faith rather than reason. We see, then, that the notion of the absurd can differ significantly depending upon whether one views existence as being essentially irrational and meaningless or essentially “trans-rational” in the sense of being beyond the scope of human reason left to itself. To distinguish Camus' ideas of the absurd from those of other philosophers, his notion is sometimes referred to as the "Paradox of the Absurd." His early thoughts on the Absurd appear in 1937 in his first collection of essays, L'Envers et l'endroit (The Two Sides of the Coin). In 1938 absurd themes again appear, this time with more sophistication, in his second collection of essays, Noces (Nuptials). In these essays Camus does not offer a systematic account of the absurd or even a conceptual definition of it; rather he reflects on the experience of the absurd. This approach is in line with much of existential thought which appropriates the phenomenological method of Edmund Husserl to its own themes and interests. By eschewing abstract explanatory reasoning in favor of concrete analyses, this more descriptive way of thinking attempts to reveal the essence of a particular kind of experience as it is “lived.” Given the irrational or trans-rational “nature” of the absurd, we can see how this descriptive approach would be particularly useful for a philosophical analysis of the absurd. In 1942 Camus published his most famous essay on the absurd Le Mythe de Sisyphe (The Myth of Sisyphus). This famous Greek myth tells the story of Sisyphus, who was condemned to spend his life rolling a rock up a hill. Whenever Sisyphus reached the top of the hill, the rock would roll back down. The next day Sisyphus would have to begin all over again. Camus likens this myth to the state of our human condition in which we search for meaning in a meaningless universe. We toil throughout our lives, struggling each day to survive, only to die in the end. Although we continually search for some meaning, our attempts to find any absolute meaning are futile. We must then learn to live in this absurd existence in which we know that life as a whole is meaningless and yet we strive daily for our own small joys and happiness. Throughout the Myth of Sisyphus as well as other essays Camus explores the paradoxical dualisms of human existence, such as happiness and sadness, light and darkness, and life and death. In this way, Camus challenges his readers to face up to their human finitude or mortality, and so accept that all happiness is fleeting. His aim, however, is not to be morbid, but to encourage his readers to love life all the more and so enjoy all forms of happiness despite their temporal natures. The absurd man feels released from everything outside that passionate attention crystallizing in him. He enjoys a freedom with regard to common rules . . . The return to consciousness, the escape from everyday sleep represent the first steps of absurd freedom. Like other existential thinkers, Camus’ preference for concrete, descriptive analyses as opposed to abstract conceptual argumentation led him to express many of his philosophical ideas through artistic forms such as fiction and drama. In these ways the plight of the human condition is conveyed through characters that are caught in various “existential situations.” In 1942, the same year that The Myth of Sisyphus appeared, Camus published his first novel L'Étranger (The Stranger). The story is told through the eyes of Meursault, an alienated young man living in Algiers. At the death of his mother, Meursault reacts with apparent apathy; at the request of his girlfriend that they marry, Meursault responds indifferently; finally, on a hot summer’s day, in the glare of sunlight, Meursault shoots and kills an Arab for no apparent reason. In the end Meursault is found guilty of murder and is sentenced to death. On the eve of his execution, a priest visits his cell and tries to persuade him to confess. Meursault refuses and so denies himself absolution. As Camus himself describes it, in the protagonist of The Stranger, we find a man whom society condemns for “not crying at his mother’s funeral.” Meursault remains one of the most famous twentieth-century anti-heroes that emerged in the existential literature of the post-war period. Camus also wrote a play about the Roman emperor Caligula who likewise pursued an absurd logic. Convinced of the meaninglessness of life (“Men die and they are not happy.”) Caligula seeks to convince all his subjects of this truth by practicing a cruel and arbitrary abuse of power. In the end Caligula is killed by an assassination that he himself had orchestrated. Camus’ relation to the play's anti-hero remains, as it does with Meursault, rather ambiguous and one is left to ponder Camus’ own interpretation. Other plays which Camus is known for include The Misunderstanding and The Possessed, which was adapted from Dostoevsky’s famous novel of the same name. 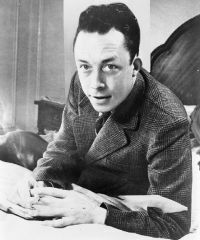 Camus’ other works of fiction include The Plague, The Fall, and the two posthumously published works, A Happy Death and The First Man. In Camus’ novel The Fall the narrator Jean-Baptiste Clamence tells of his sojourn from a once successful defense lawyer in Paris to his discovered vocation as a “judge-penitent” in the smoky avenues of the Red-light District in Amsterdam. Throughout the story the narrator confesses his egotistic vices and in doing so judges not only himself but an entire culture. In presenting this lucid critique of modern western civilization, however, Jean-Baptiste insists that only the one who is truly penitent and so cognizant of his deeply rooted flaws has the right to judge. Although clearly borrowing many Christian themes throughout the work, Camus concludes by once again striving to find meaning, mercy and forgiveness in a godless universe. Thus, Camus’ existential humanism remained, like Sartre’s, a secular one. In 1934, Camus joined the French Communist Party. This involvement was apparently motivated by his concern over the political situation in Spain (which eventually resulted in the Spanish Civil War) rather than direct support for Marxist-Leninist doctrine. In 1936, the independence-minded Algerian Communist Party (PCA) was founded. Camus, however, joined the activities of Le Parti du Peuple Algérien, which got him into trouble with his communist comrades. As a result, he was denounced as a Trotskyite, and eventually he quit the party. From 1937 to 1939, he wrote for a socialist newspaper, Alger-Republicain. One article he wrote during this period was a vivid account of the peasants of Kabylie who lived in extremely poor conditions. This article apparently cost Camus his job and demonstrates again how his existential concern for the individual always trumped any political ideology. Throughout the war and afterwards, Camus continued to oppose totalitarianism, be it in the form of German fascism or the revolutionary philosophy of radical Marxism. As mentioned earlier, Camus' well known falling out with Sartre was linked to the former’s opposition to the more totalitarian forms of communism. Camus detected a reflexive totalitarianism in the mass politics espoused by Sartre in the name of radical Marxism. This was apparent in Camus’s essay '’The Rebel'’ which was not only an assault on the Soviet police state, but also questioned the very nature of mass revolutionary politics. <blockquotye>But I am not one of those who think that there can be a compromise, even one made with resignation, even provisional, with a regime of terror which has as much right to call itself socialist as the executioners of the Inquisition had to call themselves Christians. This page was last modified on 16 February 2019, at 22:39.